The degree of emotional damage my mother inflicted on my brother and me can’t be measured. When we were together, just the two of us, Jerry and I avoided talking about our mother. One week before his death my brother, Jerry, fifty-eight years old, called me from his hospital bed. We laughed and talked about many things, including our love for peanut butter candy, our favorite pets, even our first-shared automobile---a cherry-red Chevrolet Convertible. My brother sounded youthfully happy as he reminisced about our good times, particularly the fun we had studying ballroom dancing. Most of all, my brother wanted to talk about Dottie, the love of his life. His voice sounded shaky, a little teary, as he shared the sad memory of Dottie ending their high-school romance. When he talked about the elaborate cake our mother baked to celebrate Dottie’s breakup with my brother, he couldn’t hold back the tears. I knew the story well, how Dottie began dating other guys, eventually married, and moved to another state. In an attempt to replace Dottie, my brother dated one girl after another and, all too soon, married and fathered a child. Outwardly, Jerry appeared to have moved forward with his life but I knew otherwise. Eventually, through the small town rumor mill, I learned Dottie divorced and, not too many years later, was diagnosed with a rare and incurable disease. I don’t recall the date Dottie’s obituary appeared in our hometown newspaper. One week later, my 58 year old brother died. Devastated, I returned to Pine Bluff for his funeral. An attendant greeted me at the funeral home door and ushered me to a back seat, far from the family section. I learned later that my mother and sister-in-law had decided to “put me in my place” on the chapel’s back row. At the end of the service I watched those in front of me (I was the only person on the back row) being directed to a reception room. Alone, I walked to the front of the chapel to stand beside my brother’s casket. Several funeral attendants stepped forward to close the casket then moved away when they recognized me. 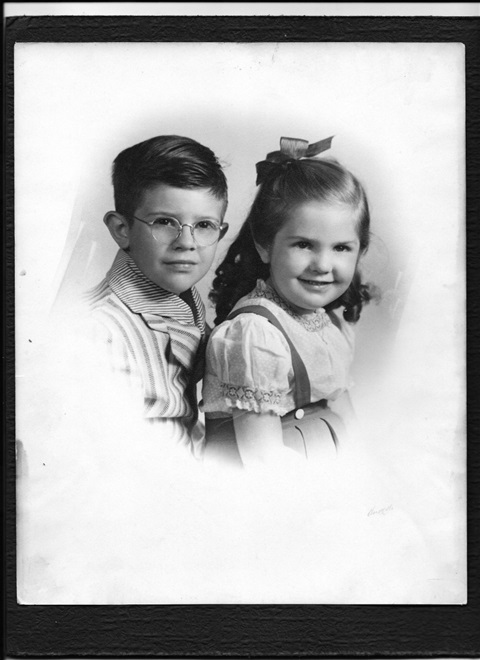 Slowly, I reached across the steel vault’s creamy satin lining to pat my brother’s cheek. I took my time, my fingers moving upward to smooth his graying hair, thinking “He is fifty eight years old but to me, he’s still a boy.” In death Jerry looked relaxed, at peace and, maybe, enjoying his final rest. Facing a time restraint, the attendants began working around me, moving flowers, tucking the satin drapes inside the casket, and politely saying “excuse us” before closing the casket’s heavy lid. Reluctantly I stepped aside as the funeral director grasped the casket’s metal handles and guided it through the doorway toward the black hearse. Outside, I saw the parade of funeral cars lined-up behind the hearse, ready to participate in the cemetery procession. Standing there, watching the black hearse chauffeur my only sibling to a waiting grave, I remembered a melody, one of my brother’s favorite tunes from the fifties. I pictured my brother as I remembered him best---dancing. Like it was yesterday I could see Jerry mastering the dance floor with the greatest of ease, his smooth style delivering every step in time to the rhythm. I closed my eyes and watched him lead his partner through difficult dance moves while the music played “Only you and you alone, can thrill me like you do and fill my heart with love for only you.” Take care of him, Dottie. He never loved anyone else---only you.